Technology has come a long way, baby, especially when it comes to compact, rugged cameras. When my dad sailed to Hawaii in 1985, he took our “high-tech” RCA VHS video recorder. Although an innovative, portable unit – relatively speaking – the camera and requisite VCR was a beast, requiring a tote bag on a shoulder strap, and it was far from rugged. Those days are gone. Cameras are smaller, more rugged, and loaded with great features that make even amateur work pretty darn impressive. When it comes to shooting video aboard our Cape Dory 36, I’ve been using a Sony Digital8 camcorder, which has proven to be a handy camera for about three hundred bucks, but it isn’t especially rugged and, the biggest liability, it isn’t waterproof. For a couple years now, I’ve been on the lookout for a water-proof (or at least water-resistant) camera that shoots quality video. Back in October I came across the GoPro line of all-weather 1080p HD digital cameras. Their website, filled with customer testimonials, great footage and plenty of detail, convinced me that the GoPro Hero was the camera I’d been looking for. 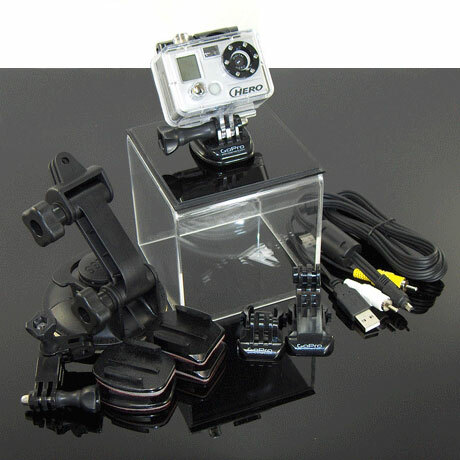 The GoPro HD Hero comes with a polycarbonate housing that is waterproof to 180′, a rechargeable lithium-ion battery, all necessary cables, and a one-year warranty. It features various modes for recording still and video, including time-lapse and 1080p HD video. The lens has a super wide 170 degree viewing angle (127 in 1080p) for capturing plenty of action. In photo mode, the camera records 5 megapixel pictures. It retails for about 260.00. GoPro also sells several mounts for securing the camera. Their articulating mount designed for bicycle seat posts would work well on a sailboat, allowing the user to attach the camera to railings, pulpits, and other hardware for great angles. Check it out for yourself. Visit the GoPro HD Hero page for specifications and features. And if you get one, be sure to share your sailing footage here!